Where will all of the camp classes be held? We suggest using uber, lyft, or a taxi service if you are from out of town and do not have a car. The Charlotte Airport is a major hub and is a wonderful place to fly in for those coming from out of town. The recommended hotel (see below) will also provide a shuttle service between the hotel and the Meyers Park Baptist Church. ​How do I know which program to register in? Visit our About page to view the various programs and requirements to select where you or your child/student should enroll. A Camp is intermediate to advanced levels (Books III-IV in the O'Connor Method), B Camp is beginning levels (Books I-II in the O'Connor Method). Half-Day Camp is for children ages 4-7. 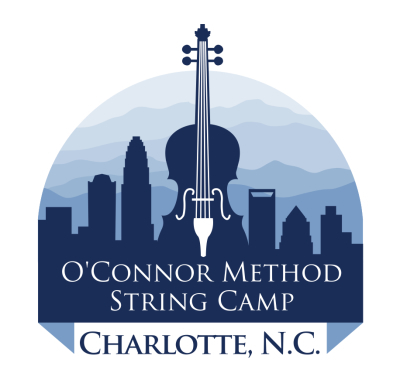 At least 6 months of playing experience on the instrument is recommended but not required to attend the O'Connor Method String Camp. Teacher Training is for string teachers. Students must bring their own instrument(s), books, and a music stand. What is the Chaperone policy if my child is under age 11? For students 11 and under in the A and B Camps, a chaperone is required. The chaperone does not need to be in the building all day. However, we require for the chaperone to be a phone call away and able to get to the premises quickly in case of emergency. During the optional camp activities that begin at 3:00pm daily, A and B Camp students are expected to participate if they remain on the premises. Chaperones of children 11 and under must be present during the optional camp activities between at 3:00pm-6:00pm daily. Regular classes end at 2:30pm daily. For all students in the Half-Day Camp (ages 4-7), the parent/guardian must be in the building for the duration of the camp activities. How early can I check in on Sunday July 28? Check in begins at 5:00pm. Orientation and Faculty Introduction will be at 6:00pm. What are the dates/times of the camp concerts and evening events? Can you recommend any hotels around the camp? Yes. We have a group rate at the Four Points by Sheraton Charlotte! Standard Double, Double Suites, and King Suites available for $114 per night. Rate includes complimentary shuttle to and from camp venue, breakfast, and highspeed wifi. Rate is designed for a stay July 28 - Aug 2, 2019 (check out on Aug 3). Call and tell them you would like the O'Connor Method String Camp Group Rate. Please reaserve before 6/26/19. ​How much will it cost to participate in the camp? Are instruments provided or do campers bring their own? Visit the Register page and select the camp registration link to view prices. No instruments or books will be provided. You must bring your own instruments for any classes you sign up for that require them. We will have a limited amount of O'Connor Method Books for sale during camp activities. We highly recommend students purchase books before arriving to camp to become familiar with materials as well. Keep in mind nothing has to be perfected or memorized, but the more the student knows the richer their camp experience will be. O'Connor Method books can be purchased HERE. How many campers are expected to be at this camp? ​About 120 students in the camp, and around 15 teachers per class in the teacher training courses. For teachers, what is the benefit of being certified in the O'Connor Method? Mark O'Connor, the author of the O'Connor Method, will be conducting Teacher Training in both Books I & II as well as in Books III & IV. The teacher certification program provides in depth training in teaching the fundamental elements of the American music styles and techniques such as improvising, chords, ear training, modes and rhythms. Principally, teacher trainers will learn all of the main teaching points to each tune and the natural sequence of each acquired technique that each piece possesses. The fact that the music is enjoyable to both children, parents and teachers to the point where the music can easily be brought to any professional concert is a very big plus with the O’Connor Method materials. Certified teachers will be added to the oconnormethod.com "Find a Teacher"registry page here. To read more about Teacher Training, click here. What kinds of classes will be offered for the A and B Camps? Each student is required to take a group class and a master class on his/her instrument at his/her playing level. These core classes are based on the O'Connor Method materials. Each student also chooses two electives for the week. See below. During any free time students can do arts and crafts, jam with friends, and create small bands or ensembles. The rest of the events for the day (beginning at 3:00pm) are optional for A and B Camp students, but highly encouraged! We also encourage chaperones and parents to participate/observe these events. Any underage students not participating in these events will need to be picked up by their chaperone for the day. The daily All Camp Orchestra places the faculty in the first desks of each string section, and additional faculty and teacher-trainers in seating assignments, each with an empty chair to their side to be filled by students at various levels and of any age to create a 100-piece string orchestra and a unique learning experience! Repertoire is from O'Connor Method Orchestra Book II. Each day ends with a Student Recital and a Jam Session, during which the students play for each other – often sharing their recent creations that happened during classes and free time that day. Will any instruments be provided? What about for the Mandolin or Guitar classes? No instruments will be provided. You must bring your own instrument for any classes you sign up for that require them. If you are interested in renting an instrument, we suggest contacting the Violin Shoppe in Charlotte, which should have any instruments available for rent or purchase that you will need to participate in the camp. Visit the Violin Shoppe's website HERE . What if I'm an adult beginner? What course should I take? Will I be the only adult there? We plan on having a healthy amount of adult beginner, intermediate, and advanced players attending the camp. If you are an adult interested in taking classes in the A or B Camps, we will be dividing classes according to age level. Depending on the eligibility guidelines on each registration page, adults can apply to the A or B Camps. Half-Day Camp is strictly for younger students ages 4-7. A Camp is for intermediate to advanced string players in Books III-IV, and B Camp is for beginning string players in Books I-II. What should camp participants bring? Camp participants should bring a music stand, their instrument(s), their O'Connor Method Books, a water bottle, lunch if they plan to eat at the camp venue, their badge given at check in, and know their individual schedules given at orientation. O'Connor Method books will be for sale at the camp throughout the week. Are lodging and meals provided at this camp? No. Lodging is by individual arrangement: Hotel recommendation above. Meals are not provided. Underage students can either be picked up by their own chaperone during lunch time or will need to bring a lunch to eat at the camp venue. There will be a designated location available daily for all camp participants bringing their lunch. ​Where do I purchase O'Connor Method Books? You can purchase O'Connor Method books Here. Do you give refunds? There are no refunds after June 28, 2019. Unfortunately there are no exceptions. Registrations can not be carried over from one year to another. What is the Pearl Award? Learn about the Daniel Pearl Memorial Instrument Award Here. Is there still a camp in New York City? No, the O'Connor Method Camp NYC is being relocated to Charlotte North Carolina, as the directors Mark and Maggie O'Connor have moved there! We look forward to this new chapter, and are excited for you to join us! How late do you take registrations? We take registrations up to the first day of camp, however we recommend registering early so you can avoid the raised registration fee and we can have a better opportunity to place you in the elective classes you chose. See the registration pages for more information here. Camp participants that register after June 28 may not get a custom printed lanyard badge and similar official custom printed materials associated with camp. They may also be subject to not getting into their elective choices depending on the scheduling. Yes, however we do not have an application process for scholarships. We give scholarships to established organizations to award. We also have the Daniel Pearl Award at our camp every year, in which four students will recieve a full tuition scholarship to attend the following string camp. Read more about the Daniel Pearl Award here. Maggie O'Connor creates violin peg necklaces to sell to raise funds for scholarships at the camp. To purchase a necklace, visit her website here. Please contact us to donate pegs and parts to contribute to this cause. We also take financial donations for scholarships, contact us at [email protected] to find out how to donate. Thank you for your support! What if my student has no experience with the O'Connor Method? Is this camp for them? Absolutely! We do not require any previous experience with O'Connor Method materials to participate in this camp. We do encourage students purchase the appropriate books before camp starts to become familiar with the materials in order to get a richer experience, however nothing needs to be perfected or memorized. We will also have a limited supply of books available for purchase at the camp. Suzuki students frequently attend our camps, and often switch to the O'Connor Method in their lesson plan because they like it better! This camp is for everyone and we welcome aspiring string players from all backgrounds. Can Guitar and Mandolin students register for the A or B Camps? Yes, however we want to make sure students know the camp is primarily geared towards learning bowed strings: violin, viola, cello, and bass. For those mandolin and guitar students that want to participate in more classes than the option of sigining up for the mandolin or guitar elective on its own (which are each only one hour per day), students can register for a full day of camp. We recommend they have prior experience on their instrument, as the bowed string instruments are the main focus of this camp. If guitar and mandolin students register for the entire day of camp, generally we recommend the B Camp as the repertiore in O'Connor Method Books 1-2 allows for the most versatility of the guitar and mandolin students. If you or your student are interested in registering for a full day of camp on mandolin or guitar, we recommend contacting us to let us know, and indicating you are registering as a mandolin or guitar student on the registration form online as well. No. We are only equipt to take registrations online. This means if you arrive at orientation and wish to register, we will still have you register online. We recommend registering on a computer, not a cell phone. Please register for the A Camp, B Camp, Half-Day Camp, or Teacher Training on the Registration page. Be sure to fill out the entire form and then click "submit", after which you will be redirected to the Paypal page to submit your payment online. Registrations are not valid until payment is recieved in full. What Method Books should Viola, Cello, and Bass students get? For ALL Viola students, we recommend purchasing Viola Book I and Viola Book II. For ALL Cello students, we recommend purchasing Cello Book I and Cello Book II. For ALL Bass Students, we recommend getting the Orchestra DoubleBass Book II part, and we will provide more materials at camp. These books are wonderful tools for beginners and advanced players, and we use them in various electives, core classes, and activities. For students wanting to prepare for the orchestra elective and/or All-Camp Orchestra period, for viola we recommend getting Orchestra Viola Book I and Orchestra Viola Book II, for cello the Orchestra Cello Book I and Orchestra Cello Book II, and for Bass, Orchestra Doublebass Book II (we will provide these books in the orchestra classes and activities, this is just a suggestion for students wanting to preapare before camp starts). When applicable, we will provide more advanced materials for viola, cello, and bass students at the camp. You can see all the currently released O'Connor Method Books on the store page here. For very ambitious viola, cello, and bass students, you can also check out Mark O'Connor's repertiore on his sheet music website here. Can I change the Elective Class I registered for? No. We take a lot of time and care in creating a schedule for every individual student, so please be sure of your elective choices when you register, as they can not be changed once you submit your registration. All of our electives are fabulous, and if you feel you want to experience another one, you can sign up for it the next year! Students that register after June 28 might not be placed in their elective choices, but we will do our very best!